This new image shows the results of a vast collision between two galaxies. 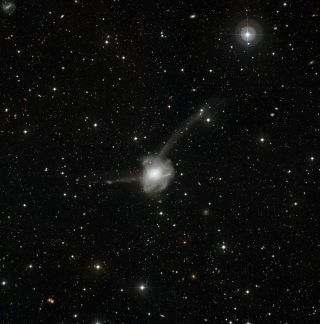 This strange object is known as NGC 7252, or Arp 226, and has the odd nickname Atoms-for-Peace. The picture was taken at ESO's La Silla Observatory in Chile. It is a combination of exposures taken through blue and red filters, for a total exposure time of more than four hours. A new image of a galactic pileupshows the vivid chaos oftwo colliding galaxies, giving astronomers a ringside seat to watch howthecosmic mergers can influence the evolution of the universe. By examining these cosmic smash-ups,scientists can unlockclues regarding galactic ancestry and can better understand how galaxycollisions shape the universe over time, astronomers said. The new photo is a snapshot of theAtoms-for-Peace collisionset against a rich backdrop of distant galaxies. The interplay ofgravitationalinteractions can be seen in the shapes of the tails made from streamsof stars,gas and dust. The image also shows the spectacularshells that formed asgas and stars were ripped out of the colliding galaxies, and thenbecame entwinedaround the collision's new joint core. While a good deal of materialwasejected into space from the collision, some material in other regionsis compressed,triggering burstsof star formation. This has led to the birth of hundredsof very youngstar clusters, approximately 50 million to 500 million yearsold. Thesedensely packed consortiums of stars, known as globular clusters, aredistinguished from galactic clusters because of their ancient age andsize(often 100,000 stars or more). Since galaxy collisions are drawn-outevents that lasthundreds of millions of years, astronomers have ample time to studythem. Thisis helpful, since Atoms-for-Peace may be a harbinger of our owngalaxy's fate,researchers said in a statement. Astronomers predict that in 3 billionto 4 billion years,the neighboring Andromeda Galaxy will slaminto our own Milky Way, much like what happened withAtoms-for-Peace. Still,since the distance between stars within a galaxy is so vast, it isunlikelythat our sun will end up in a head-on collision with another starduring the merger. Atoms-for-Peace, which is also knownas NGC 7252 and Arp226, is just bright enough to be seen by amateur astronomers as asmall, veryfaint, fuzzy blob. The object's interesting nickname also has its ownnotablehistory. In December 1953, PresidentEisenhower gave a speech thatwas dubbed "Atoms for Peace," in which he promoted nuclear power forpeaceful purposes. The hot-button topic made waves in the scientificcommunityand beyond, to such an extent that NGC 7252 was named theAtoms-for-Peacegalaxy. Yet, the moniker is oddly fitting,since the giant loopsthat are visible resemble a textbook diagram of electrons orbiting anatomicnucleus. This image of Atoms-for-Peace wasproduced by the EuropeanSouthern Observatory's Wide Field Imager at the La Silla Observatory inChile.